The control panel on your Kenmore Elite dishwasher contains the buttons that are used to input the dishwasher settings and start the dishwasher. 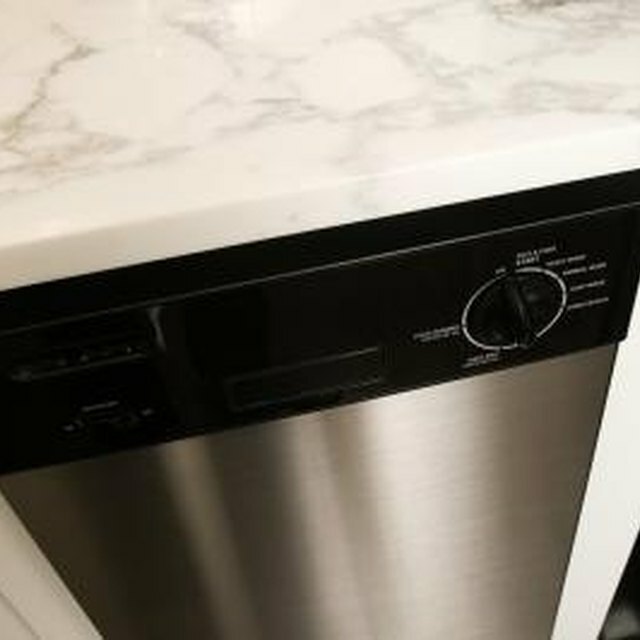 If the control panel shorts out or is damaged, you need to replace it with a new panel, as the dishwasher will not function properly. The control panel is secured to the dishwasher using several screws, and it has a control board, a control board cover and a door latch that you need to transfer to the new control panel. Turn off the dishwasher breaker in the main electrical panel. Open the dishwasher door. Remove the screws that secure the control panel to the door. The screws are located on the top of the inner door panel. Close the dishwasher door, but do not latch it. Rotate the control panel down so that the interior of the board is exposed. Remove the control board cover by depressing the tabs securing it to the control panel. On some models, there may be a tab that you will need to access through a hole on the underside of the control panel, using a flat-head screwdriver. Unplug the flat ribbon connector from the side of the control board. This inputs the user data from the control panel to the control board. Depress the tabs securing the control board to the control panel, using a flat-head screwdriver. Remove the control board from the control panel. Release the tabs on the side of the door latch assembly, which secure the assembly to the control panel. Remove the assembly. Remove and discard the control panel. Snap the door latch assembly into the new control panel. Snap the control board into the new control panel. Connect the control panel ribbon connector to the terminal on the side of the control board. Replace the control board cover, pressing it into place to engage the tabs. Align the new control board with the top of the door. Install the screws through the inner door panel to hold the board in position. Close the dishwasher door. Restore power to the dishwasher by turning on the breaker in your electrical panel.